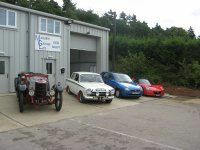 We offer a wide range of services for Motor sport in particular Classic Rallying. These range from pre and post rally checks, fabricating products for cars such as guards, modifying components to improve your overall result, we can also rebuild your engine to your specification from either out an out speed or low down grunt for twisty tests. Here at Maulden Garage we can also build you a reliable car for rallying. This can be be done in a few different ways either by us building you a car from a bare shell which means you can have it made to what ever specification you require. If you already have a classic car and would like to start competition driving then we can modify your car to suit the type of rallying that you wish to take part in. We are also available on a consultancy basis which means if you find your dream rally car and would like a professional opinion on it we go and view it on your behalf and tell you if its a over priced rust bucket or a great deal. We also offer Rally and Event support so if you are unlucky enough to have an unfortunate break down we will be on hand to help fix your car to get you the end of your rally. After all no one likes to retire from an event and this is why we have been asked by The Historic Endurance Rally Organisation (Hero for short) to be Hero Assist on their rallies, so if you already take part in either Hero or CRA events you may have already seen us fixing cars by the road side and in car parks. Which for us to of been asked we feel that it is a real credit to our workmanship. We do offer a much wider range services than listed on the site so if you can't find what you are looking for exactly then please do not hesitate to contact us and we will help you.